Does your organization support the mission of making homes better? Support our work with a sponsorship and get your product in front of 1,000’s of green building decision makers. 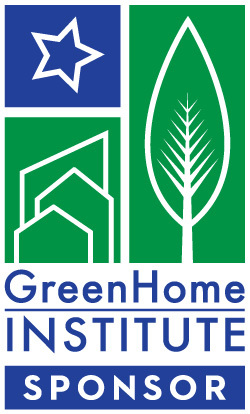 Contact Brett.Little@GreenHomeInstitute.org or 616.458.6733 to get signed up or learn more. The GreenHome Institute is seeking to partner with organizations and manufacturers who provide products and/or services to make the places we live better. We only accept sponsorship from those who have proven technologies or methods that help advanced energy/water efficiency, improve indoor air quality and comfort, reduce durability and water issues in buildings and are made from a more sustainable material or manufacturing processes. Many of our supporters come from well-known brands as well as smaller lesser known companies. You can see who is supporting us now, here. Sponsors are those who support our mission and seek exposure through the 10,000 + we reach through our newsletter and social media, 1,000’s of professionals we educate and 100’s of green building certification projects that we offer consulting on, yearly. Assisted over 200 project teams and over 50 green builders and designers on certified residential buildings. Attendees breakdown includes those seeking GBCI and AIA credits and are split up by professionals such as 50% designers/architects, 10% consultants, 10% raters, 10% builder-developers and the rest many different backgrounds. Limited to 5 listings a year, your company will be listed fully on the GreenStar Online Checklist. http://greenstarchecklist.greenhomeinstitute.org/ GreenStar is one of the highest ranked pages on our website for traffic.